The twelve MULTIGRADE filters are numbered 00-5 in 1/2 steps, with the lowest filter number corresponding to the softest contrast. Filters are available in sets of filters 8.9 x 8.9cm (3 1/2 x 3 1/2 inches) and 15.2 x 15.2cm (6 x 6 inches). 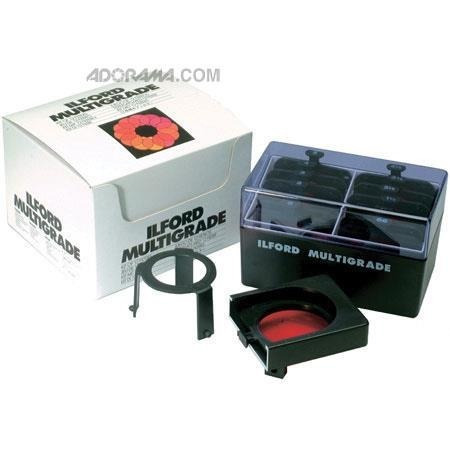 They can be used above or below the lens and can be cut to fit the enlarger filter drawer. Filter sizes 30 x 30cm (11.8 x 11.8 inches) are available to special order. MULTIGRADE filters are very easy to use: no complicated calculations are needed when changing from one filter to another. The exposure time for filters 00-3 1/2 is the same; that for filters 4-5 is double.